Beautiful backdrop on the bike course at the Tupper Lake Tinman. Courtesy of Tupper Lake Tinman. Competitor at the 2016 Vermont Sun Triathlon Series at Lake Dunmore.Pat Hendrick Photography. You Can Do It Summer Races! You may have recently finished the Delmar or Saratoga Lions duathlons, or the Anyone Can Tri, Cooperstown or Hudson Crossing triathlons – all awesome events, whether it’s your first go or you’re a multiple-times finisher. Now it’s time to do some great early- and mid-summer events in our region! If you’re lucky, you’re already registered for the exciting up-and-comer, the third annual Great Sacandaga Challenge Triathlon on June 17 in Broadalbin. Directed by the Sacandaga TriClub, it’s an exciting family event with kids and adult triathlons. Yes, kids listed first, but that doesn’t mean this club – including experienced Ironman racers – is overlooking their wonderful Adult Sprint Triathlon! Open to individuals and teams, it’s a 750-meter swim, 20K bike and 5K run. The Youth Triathlon for ages 7 and up has a 100-yard swim, 3.1-mile bike and one-mile run. The free entry Kids Splash & Dash has no minimum age and a fun short swim and run. For more info, visit: greatsacandagachallenge.com. Just over the border, the Vermont Sun Triathlon Series has five great triathlons and this is their 32nd year! Steve Hare and family direct the races, along with race directors Ruth Bullock and Chaz Lyons – that’s 163 events with 32,000 participants! 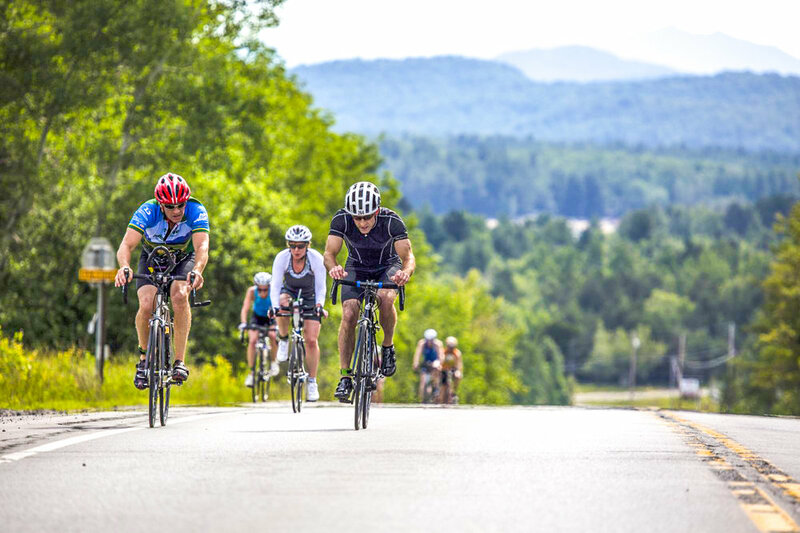 The Vermont Sun Triathlon is on June 24, July 16 and August 13 with sprint distances of 600-yard swim, 14-mile bike and 3.1-mile run. Nestled against the Green Mountains is Branbury State Park on Lake Dunmore. The lake region is a most spectacular and pristine place to swim, bike and run. Novice and advanced athletes marvel at the beauty of their courses, including a good number from eastern New York – such as yours truly, Christine McKnight and Carl Regenauer. The organizers provide professional digital photos free to all racers, done by our very own, Pat Hendrick Photography of Paul Smiths. Two- or three-person relay teams are allowed. Branbury State Park is included in your entry fee, with a nominal charge for adults/kids, so bring the family and enjoy the lake, beach and mountain setting. The Lake Dunmore Triathlon is on June 24 and August 13, with Olympic distances of 0.9-mile swim, 28-mile bike and 6.2-mile run. Again, two- or three-person relay teams are allowed; this is where I got my start before I was a swimmer – actually, back then the third leg was paddling! Same perks apply. For race details, course maps, elevations, results and registration, go to: vermontsun.com. This is the 35th anniversary of the Tupper Lake Tinman, is on June 24, so come see why it’s one of the longest running races in the United States! Having gone back to its local directorship, the Tupper Lake community is fully behind this quality event, which starts and finishes at the Tupper lake Municipal Park – so come up and Race the Adirondacks! The classic Tinman and Team Relay, is made up of a 1.2-mile swim, 56-mile bike, 13.1-mile run. The Aquabike is a 1.2-mile swim and 56-mile bike. The Olympic race is a 0.9-mile swim, 26-mile bike and 6.2-mile run. The Sprint is a 0.5-mile swim, 13-mile bike and 3.1-mile run. There’s something for everyone! For Garmin-friendly course maps, race info, history, results and registration, visit: tupperlaketinman.com. Start of the SkyHigh Xterra Off-Road Triathlon at Grafton Lakes State Park.Courtesy of Bikeman. The 18th annual XTERRA SKYHIGH Off-Road Triathlon is on July 15 at Grafton Lakes State Park, just east of Troy. With a 1K lake swim, 20K mountain bike and 6K trail run, it’s a fun challenging event in a beautiful state park – an ideal spot for your family to enjoy a cookout, the beach, lake and trails! Later that morning, the ever-popular SKYHIGH Kids’ Triathlon takes place at the same location with a 100-meter waist-deep swim, 5K relatively-gentle mountain bike, and 1K out-and-back trail run. All races start and finish on the beach. To get your kids ready for this adventure and fall sports, check out the SKYHIGH Youth Multi-Sport Adventure Camps, which take place over five weeks from July 3 to August 4 in Averill Park. The races and camps are directed by John and Kathy Slyer. To learn more and register, go to: skyhighadventures.com. The Capital District YMCA presents the Pine Bush Triathlon on July 23. This flat, fast and safe point-to-point race is ideal for both newbies and experienced athletes. It’s a 325-yard swim, 14-mile bike and 3.25-mile run, starting at Rensselaer Lake in the Albany Pine Bush Preserve, and finishing at the Guilderland YMCA. Perks include free post-race massage and gender-specific dri-fit weave T-shirt. The race is open to individuals and teams, so give it a try! Registration closes on July 18 and there’s no day of race, so register today, by visiting active.com. Please also consider the 32nd Piseco Lake Triathlon on July 15 at Piseco Airport in the southern Adirondacks, near Speculator. It’s a fabulous, low key 0.5-mile swim, 11.5-mile bike and three-mile run, open to solo and three-person teams. Register at: speculatorchamber.com. The Delta Lake Triathlon, part of the ATC Endurance Series, is held at Delta Lake State Park, near Rome on July 15. The sprint is a 750-meter swim, 12-mile bike and 2.9-mile run, and the intermediate is a 1,500-meter swim, 24-mile bike and 5.8-mile run. Learn more and register at: atcendurance.com. Your next challenge – next month, we’ll preview the Capital District Triathlon Club’s Crystal Lake Triathlon on August 19 in Averill Park, and Adirondack Race Management’s Lake George Triathlon Festival on September 2-3. Push yourself, enjoy these super events and have a great time!